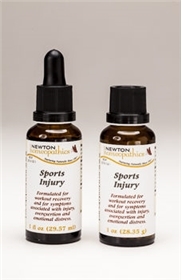 Relieve symptoms of pain, bruising, and swelling as a result of a sports related injury. Assists the body in quick recovery from shock, emotional distress, and trauma associated with the injury. Directions: Place drops twice into mouth every 10 to 15 minutes until pain diminishes. For lingering pain and swelling use spray 1 to 4 times daily. Ingredients: Arnica, Chamomilla, China, Hypericum, Ledum, Phosphorus, Ruta, Rhus tox., Staphysagria, Symphytum 15x. Arnica, Calendula, Hydrastis, Hypericum, Symphytum 3x. Alcohol 20%.